The first week of the World Cup has been filled with moments of brilliance, upsets, controversial refereeing decisions and (most importantly) goals. Before the start of play on Wednesday 49 goals had been scored in 17 matches (that’s 2.88 per match), a fantastic statistic for any football fan. Daily News Egypt takes a look at the eight groups as we enter the second week of the greatest show on earth. The hosts Brazil faced Croatia in the first game of the tournament but things did not go quite to plan for the South American football giants. Brazil scored the first goal of the tournament, but at the wrong end. Marcelo, running back towards his own goal to defend a cross accidently tapped the ball past his goalkeeper. However, the Brazilians were not deterred going on to score 3 goals, Barcelona star Neymar scored twice, once from open play and fired home a penalty which went in despite the Croatian keeper getting two hands to the ball. Chelsea midfielder Oscar wrapped up the trio of goals for Brazil in the 90th minute. Brazil faced Mexico on Tuesday in a thrilling game that ended 0-0 only down to the incredible performance of Mexican goalkeeper Guillermo Ochoa who pulled off a string of fantastic instinctive stops. In their first game Mexico came out on top against Cameroon having the lions share opf the chance. Former Tottenham Hotspurs Striker Giovani Dos Santos had two goals disallowed judged to be offside. Replays show that both goals were scored from onside positions leaving the Mexican furious. He played a part in the goal that won the game when his shot was blocked by Cameroon keeper Charles Itandje, only for Oribe Peralta to follow up and slide the ball home. Before the start of play on Wednesday Brazil topped the group with four points and a one goal advantage over Mexico, also on four points. 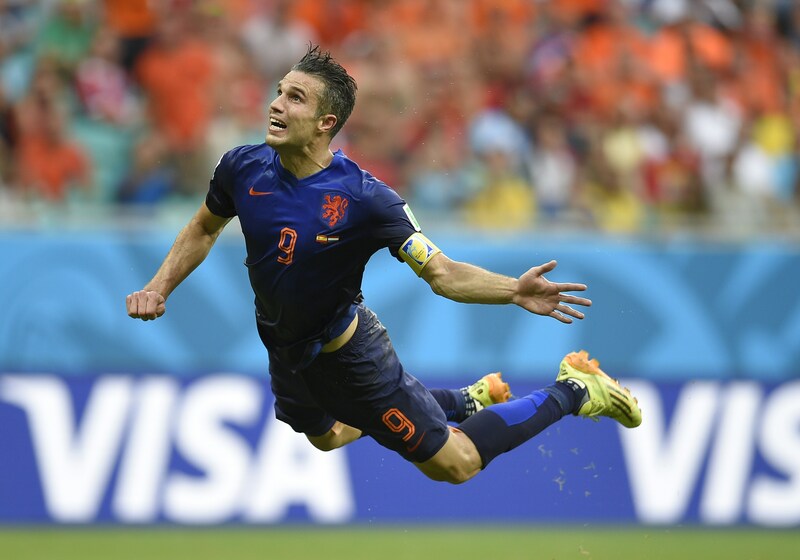 Netherlands’ forward Robin van Persie scores during a Group B football match between Spain and the Netherlands at the Fonte Nova Arena in Salvador during the 2014 FIFA World Cup on June 13, 2014. 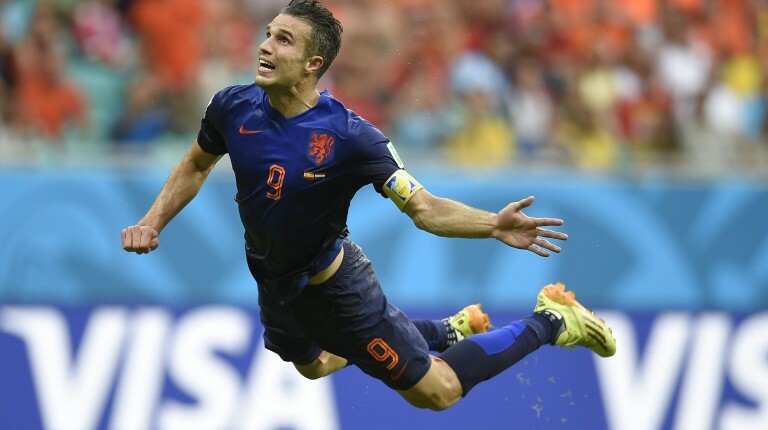 Ten goals were scored in the opening two matches in Group B, five of them coming from an in form Netherlands side, including a brace each for Robin Van Persie and Arjen Robben. The pair were instrumental in embarrassing the Spaniards, the holders of football’s greatest prize. Spain opened the scoring with a Xabi Alonso penalty on 27 minutes, but the Arena Fonte Nova was stunned just before half-time when Van Persie slipped away from Sergio Ramos and dived onto an early cross from Daley Blind to head the ball over the goal keeper from 15-yards out. 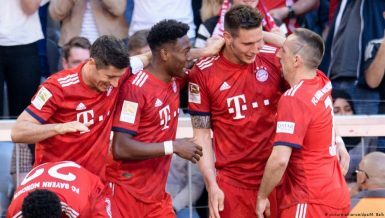 The second half saw the destruction of the Spanish side, which began when Blind picked out Robben who expertly picked the ball out of the air, side stepped Gerard Pique and fired the ball home. Van Persie and Robben both scored again, the former capitalizing from an awful mistake from Spanish keeper Iker Casillas, with Stefan de Vrij bundling the ball into the net for the Netherlands’ third goal. The Dutch dismissed claims they were out for revenge after losing out to Spain in the 2010 final in South Africa, this did not stop Robben gloating at the television cameras, displaying the score line on his fingers. The other match in Group B saw Australia lose 3-1 to Chile. 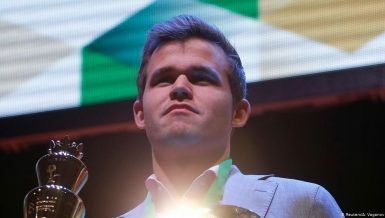 The Socceroos began poorly with their young team seemingly overwhelmed by the occasion, the defence seemed ineffective and let in two goals in two minutes. They brightened up and managed to get a goal back through former Everton midfielder Tim Cahill who rose in the box to put a solid header past Chilean keeper Bravo. Unfortunately for Australia they began on the back foot and Chile did not give up, forcing an off the line clearance and eventually sealed the victory in the 90th minute with a third goal. The Dutch top the group, with Chile in second, Australia in third and Spain in an uncharacteristic fourth due to their inferior goal difference. The champions will be looking to recover in the remaining group games to save any further embarrassment. Colombia and Greece opened the Group C matches resulting in a 3-0 win for the South American side. Both sides created chances, however the difference was the Colombians took their chances while the Greeks squandered many good opportunities to get on the score sheet and displayed some poor defensive play allowing the Colombians an easy win. The Ivory Coast scored twice in as many minutes in the second half, stunning Japan, who had taken an early lead through a fantastic goal from AC Milan midfielder Keisuke Honda. He controlled the ball with one touch and fired home with his left boot. Colombia top the group going into the second round of matches, joint on points with Ivory Coast. Japan sit in third and will look for a win against fourth placed Greece when they meet on Saturday. Costa Rica pulled off a huge upset against Uruguay, winning 3-1 and putting them top of a group that they were expected to struggle in. Uruguay were without Liverpool star Luiz Suarez who could only watch in agony from the bench as his side failed to capitalize fully on a match they controlled for 50 minutes. Uruguay’s Edinson Cavani scored from the penalty spot within 25 minutes, after Junior Diaz put his arms around Diego Lugano in the penalty area. 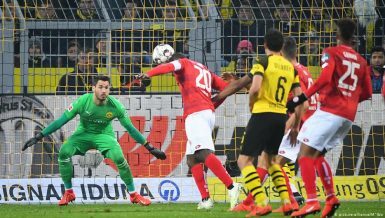 In the 54th minute Arsenal striker Joel Campbell opened the scoring, quickly followed up with second from Oscar Duarte three minutes later. Campbell put Marcos Urena through on goal who slotted home to complete the upset. England lost 2-1 to Italy in the second Group D game. Italy opened the scoring through Claudio Marchisio’s 25 yard drive into the back of Joe Hart’s net through a crowded penalty area. 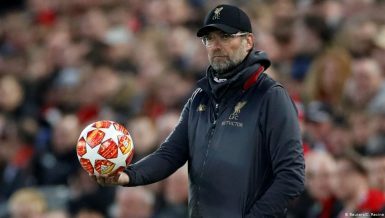 England were not disheartened and equalised two minutes later when youngster Raheem Stirling and Rooney linked up to allow Daniel Sturridge to fire the ball in at the far post. The England physiotherapist Gary Lewin was injured in the goal celebration. Mario Balotelli rose high in the 50th minute to fire a header past his former Manchester City teammate Hart, which transpired to be the winning goal. England continued to press and had some opportunities but failed to capitalize. Italy’s 35 year-old Andrea Pirlo rattled Hart’s crossbar late in the second half with a free kick that seemeingly defied the laws of physics and left the England keep floundering. He personally congratulated Pirlo at the end of the game. Costa Rica top the group before they head into two difficult games, England lie in third and face Uruguay on Thursday who will be out to prove themselves and will be hoping to get Suarez onto the pitch to cause England’s defence some problems. Switzerland clinched victory over Ecuador in the final minute of the opening game of Group E leaving Ecuador deflated. Substitute Haris Seferovic fired home the winner after the referee played advantage on a bad foul in the Swiss half, allowing for a swift and brutal counter attack. Ecuador went in ahead at half-time through an Enner Valencia header in the 22nd minute. Switzerland began their comeback early after the break with Admir Mehmedi, another substitute, headed them level before Seferovic sealed the win. 1998 winners France had a comfortable win over Honduras, who had Wilson Palacios sent off for receiving two yellow cards in a physical game. Real Madird forward Karim Benzema scored in both halves and Honduran Noel Valladares denied him a hat-trick when he poked his 48th minute shot over the line. Much of the world had been looking forward to seeing Barcelona superstar Lionel Messi and they were not disappointed. The Argentinean scored the winner against World Cup new boys Bosnia-Hercegovina, who scored an early own goal but held off the South Americans until the 65th minute. Messi played a one-two with Gonzalo Higuaín, dribbled the ball into space just outside the penalty area, hopped over a wild challenge and kept his cool to fire home with his left foot. Bosnia-Hercegovina scored a conciliation goal late on through Vedad Ibisevic, their first goal in the World Cup Finals. Iran and Nigeria played out a 0-0 draw, the first draw of the competition. The teams failed to create many chances, the closest being a disallowed goal sparing the blushes of Iranian keeper Alireza Haghighi who failed to get a good glove on the ball from a corner, despite the ball hitting the back of the net the goal was disallowed. Iran had one good chance, however, Vincent Enyeama pulled off a great save to deny Reza Ghoochannejad. Argentina are on top, Iran and Nigeria have a point each and Bosnia-Hercegovina are in fourth. 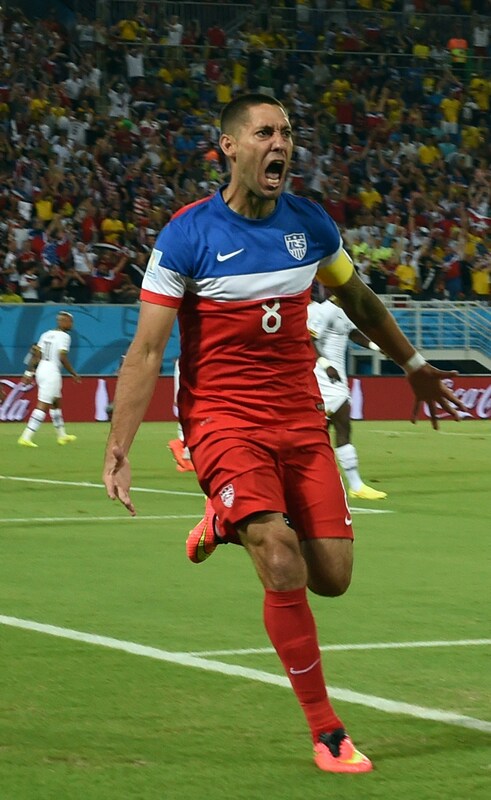 US forward Clint Dempsey celebrates after scoring during a Group G football match between Ghana and US at the Dunas Arena in Natal during the 2014 FIFA World Cup on June 16, 2014. Germany made a statement in their opening game against Portugal with 4-0 win. Thomas Muller was once again on the score sheet scoring three times and Mats Hummels headed home to complete the German score sheet. Portugal failed to make much impact on the game and was visibly frustrated. Real Madrid superstar Cristiano Ronaldo failed to take charge of the midfield as Germany defended well and moved swiftly to punish Portugal’s poor defence. The Portuguese cause was not helped when defender Pepe was sent off at 2-0 for head-butting Muller while he was sitting on the ground, believing him to be over reacting to a flailing hand to his face in a contest for possession. Team USA also began their campaign in style with former Tottenham Hotspur striker Clint Dempsey scoring the fastest goal of this year’s competition in just 29 seconds against Ghana. He ran into the box, touched the ball around a defender and fired across the goalkeeper with his left foot. Ghana were not going to let the game get away from them and continued to press until they scored in the 82nd minute through Andre Ayew, who fired in from a clever back heel from Asamoah Gyan. Their comeback was short lived however as 21 year-old John Brooks headed home four minutes later to seal the win on his World Cup debut. This tough group has been shaken up and got into the next round of matches with German on top, USA second with Ghana and Portugal with it all to do in third and fourth respectively. Manchester United’s Marouane Fellaini looked impressive as he came on to begin the comeback for Belgium against Algeria in the Group H opener. Algeria were awarded a penalty before the half-hour mark when Tottenham defender Jan Vertonghen was penalised for holding Sofiane Feghouli in the penalty area. The Algerian made no mistake from the spot and scored his country’s first World Cup Finals goal in 28 years. The introduction of Felaini on the 65th minute revived the Belgians and once he headed home Belgium looked stronger. Dries Mertens scored in the 80th minute finishing off a quick counter attack handing Belgium a 2-1 win. Russia and South Korea played out a scrappy 1-1 draw in which both goalkeepers had questionable performances. Russian keeper Igor Akinfeev twice spilled the ball from long shots and was able to recover, however he spilled a shot from Lee Keun-ho which fell helplessly from his gloves and over the line to put South Korea ahead. South Korean Jung Sung-ryong also looked uncomfortable in goal but was spared the same embarrassment of his Russian counterpart, however substitute Aleksandr Kerzhakov was able to swivel and score in the penalty area in the 74th minute to secure a draw. Belgium top the group and will look to continue the momentum built towards the end of the game to secure their place in the knock-out stages. Russia and South Korea have a point each and Algeria props up the group in fourth.